The country’s oldest main gateway will soon face a rehabilitation. 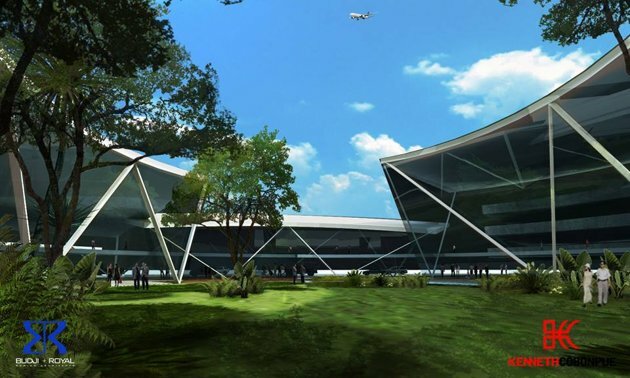 The 30-year-old Ninoy Aquino International Airport (NAIA), touted among the “world’s worst airports” is scheduled a makeover to look like a boutique airport from the hands of internationally renowned Cebuano interior designer Kenneth Cobonpue and architect Leandro Locsin’s renowned architectural firm and Associates. What is laudable about this hyped project, the love of country is sowed by equally competent designer Budji Layug and architect Royal Pineda together with Cobonque who will man the interior designs. They are doing this great stuff for pro bono. It’s a free service (wow!) to overhaul interiors of the aging and unattractive NAIA terminal one. It’s so great that while driving off to my office, I hear over from my fave FM radio staton, disc jockeys candidly discussing the cool people behind this recent finest ventures of architects and interior designers. This only shows how immensely we want all this to happen! Of course, this is an added marketing strategy about the “who’s who” behind NAIA’s upcoming facelift. Based from their respective portfolio, Cobonpue has top clients like Hollywood actress Angelina Jolie while Locsin has notable masterpieces including the iconic Cultural Center of the Philippines and remarkable edifices at the University of the Philippines. The latter is also the son of Leandro V Locsin, national artist for architecture. This selfless service by interior designers must be emulated and hailed by all of us. Not all professionals will do the same thing, especially for tycoons or ambitious young business entrepreneurs, who only want profits. The much needed renovation is a refreshing news feed after series of debates by government and the business community to transfer our international terminal airport to more spacious location in the Diosdado Macapagal International Airport at Clark in Pampanga inside the vast Clark Freeport Zone. That airport in Clark has also been tapped as the promise land for our planned premiere hub. Another feature of this special economic zone, is where Disneyland Philippines, reportedly rumored to rise soon – another pet project to watch. The Philippines is preparing for great and exciting things to come in succeeding years. We will host the World Economic Forum (WEF) in East Asia in 2014, the 27th Asia-Pacific Economic Cooperation (APEC) in 2015, a possible papal visit in Cebu on 2016, and optimistically lots of other big time international gatherings. On the other hand, despite volatile rise and fall showings of our stock market, which we have seen in previous months, tremendous mood swing of ‘hot moneys’ hastily pouring in and pulling out in the stocks, after the US market rebounded solidly. Our stock market remains the largest in Southeast Asia. Hopefully, our country will continuously bolster good projects and cleanse our country’s image as a top darling of foreign investments in the region. The more than one-billion renovation budget of NAIA One has been a pity when compared to well-funded and beautifully manicured airports of Asia. Best airports are now rising in this part of the world as good economic opportunities apparently shift to the East. I have seen personally and enjoyed my infinitely plush stroll in ultra modern airports in Dubai, Singapore, Kuala Lumpur, Bangkok, Hongkong, Beijing, and recently New Delhi. Amazingly wondered how they designed and invested much in firmly building their hub airports. Leaders of progressive countries will seriously think about the strategic value of their flagship airports as each visitor is assured to arrive comfortably and leave safely in their marbled and carpeted gateways. Embedded also in the construction of airports are the rich culture innate in every ambiance and services inside expansive and stylish airdromes. The above mentioned award-winning airports abroad distinctly raised the bar and defines what a world-class airport should be. Envied and loved by all sorts of travelers around the world. Definitely first impression lasts as people from different walks of life takes refuge for a few hours in airports with great impressions. The scents, ambiance, discounted products bought in duty free, free cyber connectivity, entertainment, and sometimes free sumptuous food in classy restaurants, advanced technology and monorails, and superb services – all in all, is definitely a total experience in itself! We lack a sense of vision. I deem great visions will bear good fruits. Add with strong political will and successful economic plan, all positive things will turn out great, as well. I know we were left behind economically; perhaps intimidated by sustained economic growth of our neighbors. As a best option, successful countries first beautified their magnificent airports which awed the rest of the world. But again, it’s never too late for us to emulate this good deeds! Philippine President Aquino sees that our country can take pride of our economic achievements sustained by good governance under his administration. This affirmative message is a sign that we can participate in the world stage and not feeling embarrassed of our basic infrastructures. Our largest airport reflects the state of our economy. If we say that our economy is taking off courtesy of good governance – then this should firmly reflect the ambiance and physical state of NAIA terminals. This is a way of presenting constructively our synergies as a people. The NAIA terminal can become a symbolic infrastructure of our country's turn around. This we must maximize to hopefully awestruck foreign visitors and balikbayan in showcasing our economic strides so far. Don’t construe it as pathetic, given our many other developmental programs that must be looked at seriously, rather look at it as a good sign of boosting our own confidence that we are actually taking off, economically. The planned rehabilitation will also upgrade our airports which suffered European Union’s (EU) ire in blacklisting our country back in March 2010. The EU issued orders that placed our country’s airlines on its watch list as a precautionary measure to impose operating ban to our flag carriers. However, our downgrade has already been seriously addressed by the Civil Aviation Authority in the Philippines (CAAP). As our historical NAIA terminal will be transformed in the coming years, along with that work-in-progress physical transformation - I also wish terminal employees, immigration officers, and top administrators working in the soon to be overhauled beautiful airport will internally be transformed, too. By writing this, I mean competence in service and a culture of good service to passengers and greeters will be well-received. Our legendary smiles, personal touch of service, and hospitality with much anticipation must be indented or shall forever reign in us. By the way, good practices must be carried in by everyone for good. We have seen constructions of Terminals II and III beside NAIA I in recent years, although with lagging legal battles and weak substandard structures. Still, spaces are cramped and runways can be imperiled. We hope the projected boutique-style terminal of NAIA will solve our bad image as one of the world’s worst airports. Through the Department of Transportation and Communications (DOTC), hopefully our flag carriers and foreign-own commercial planes will see a different and refreshing edgy look of NAIA, considered once an ugly-duckling airport. Let’s wait and see, though. Now I am looking forward to fly in a better-looking NAIA…soon! Surely, it’s gonna be more fun in NAIA!